The TripleHead2Go is a powerful way to display content across multiple screens. When plugged in, your computer thinks it's connected to a really wide display so it sends the display a wide image. The TripleHead2Go then takes that wide image and splits it into three pieces. With the Multiscreen Module for ProPresenter, content can be managed across each of these screens. 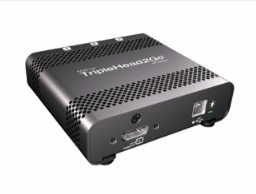 There are 3 different versions of the TripleHead2Go. Find out the one that is right for you by going here. The DisplayPort (DP) Edition bundles and Digital SE edition are the only Matrox-supported option for machines that only have a mini-DisplayPort output, including laptops and iMacs. This unit features full-size DisplayPort inputs and outputs and as such, adaptors are required for both the input and the output. These adaptors are included with the bundles. NOTE: Bundles are shipped from two different warehouses and will come in two separate shipments.